Okay...I have to admit, my creation...or at least the use of the Stamp of the Month in my creation...came about quite by accident. I decided that I wanted to apply to teach at Extravaganza this year. (Classes taught at CTMH's convention in July). One of the things that I needed to send in with my application was an altered project. Let's just say, I soon learned something about myself....I don't do a lot of altered projects. :( Fortunately for me though, one of my newest and becoming one of my dearest friends, Tamra, is the queen of altered projects. 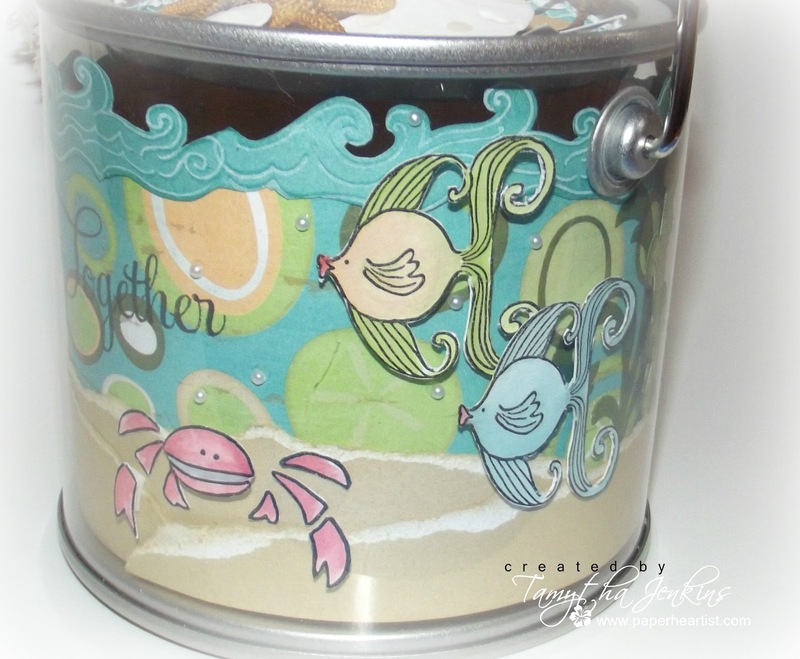 After she let me go through her numerous cabinets of boxes, cans, frames, tins, etc., I settled on a cute little pail. Not too different from the one I did here, but without the pink. When I sat down to create my altered pail, I suddenly knew that I wanted to do a beachy theme. It was definitely a project that grew during the process. At one point, I stamped the wave stamp in the Under the Sea set sideways and trimmed to create seaweed. 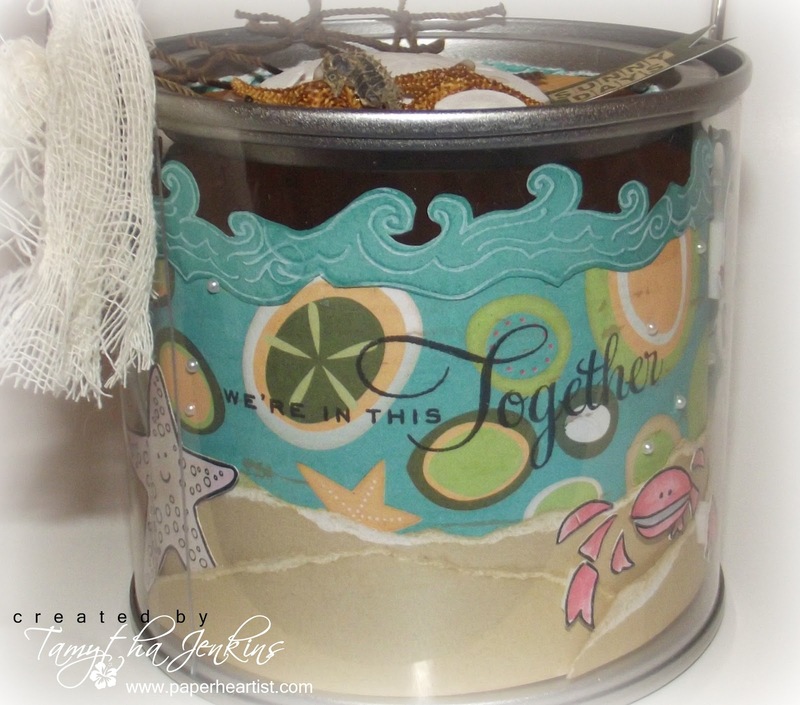 I then wanted something more...some more seaweed...then I looked over at my SOTM set and saw one of the flourishes as SEAWEED! 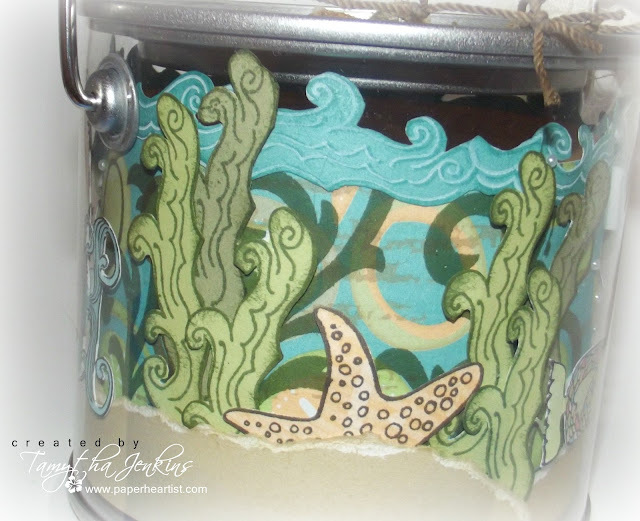 So I stamped the flourishes a few times on the background paper (behind the trimmed "seaweed" images). The next thing I had to decide on was the lid. It was plain and recessed. 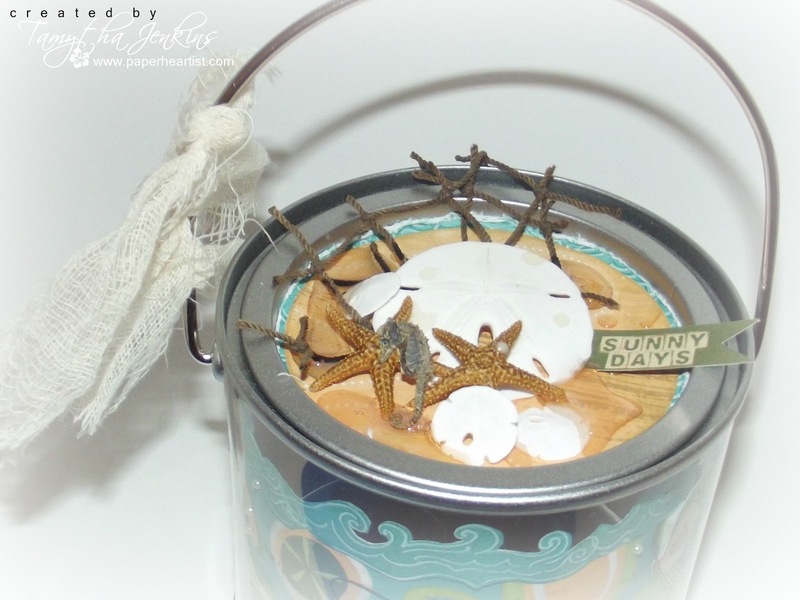 I wasn't sure how I was going to decorate it, but I recalled having some beachy findings in my stash and one thing led to another and here's what I came up with for the lid. You'll notice red lines around some of the images. 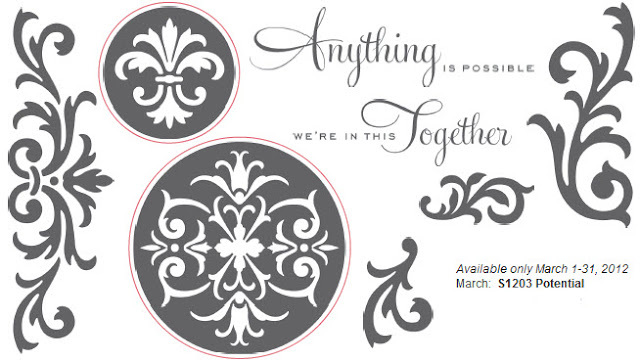 These indicate coordinating shapes on the Art Philosophy Cricut Cartridge. What you don't see here is something else that is on the set's carrying sheet...the size of the image. For example, next to the large circle image, it reads 2 3/4". So when you cut the coordinating shape, you simply cut it at 2 3/4" and the stamped image will fit perfectly. How great is that?! Remember, if you love what you've seen so far along your SOTM Blog Hop journey, and you want your own "Potential" stamp set or want to get it for the amazingly low price of $5, be sure to contact your Close To My Heart Independent Consultant. If you don't already have a consultant, I'd love to be yours. You can find details on the "Stamp of the Month" here on my blog, or by clicking on the "Stamp of the Month" tab at the top of the page or by clicking on the "Shop with Me" link near the top right. Of course, if you have any questions, please don't hesitate to contact me. If you have time, take a moment or two to check out the rest of my blog. If you enjoy your visit, then please consider "Following Me", signing up to receive blog updates, and/or leaving a comment (we all love comments...the nice ones anyway), then be sure to continue along on the hop by heading over to Katy Taylor's blog, "An Inside to My Heart" and check out her creation. You rocked your 3-D project! Best of luck getting a spot at Extravaganza! CUTE CUTE CUTE!!! 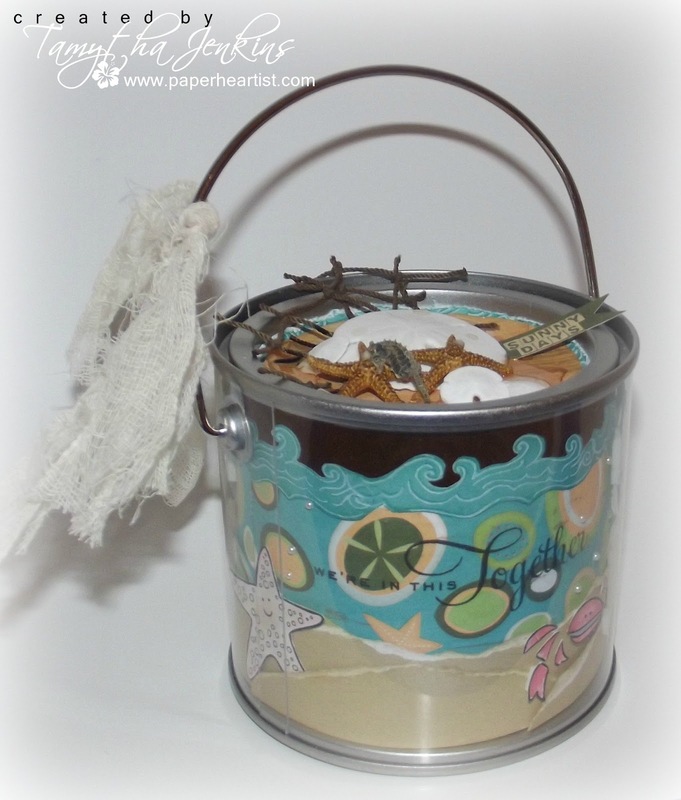 The little pail is just adorable. Good luck! 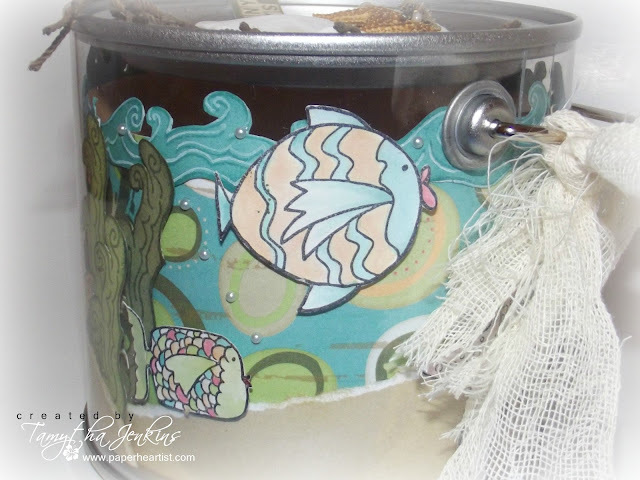 Love how you had so much fun with the fish stamps! It's beautiful! Fabulous project and good luck!